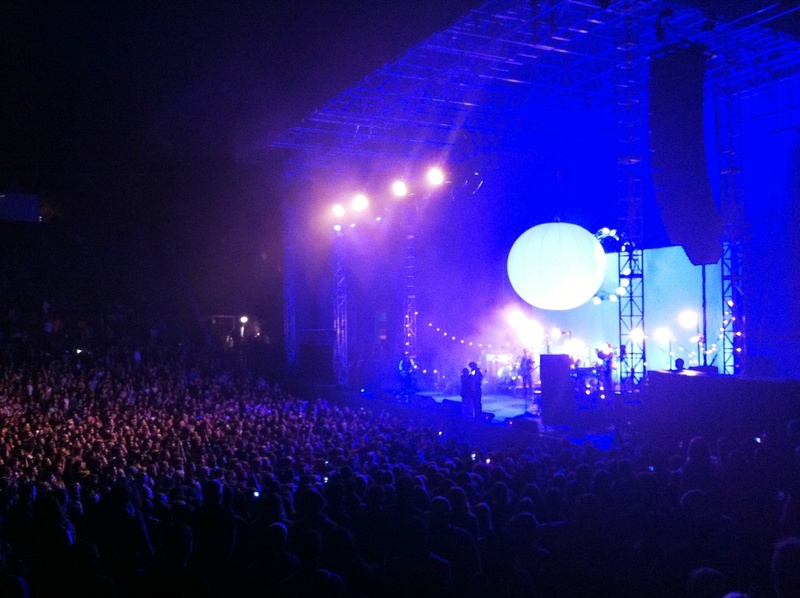 When I entered the staggering Greek Theatre at UC Berkeley on Friday night, I was instantly impressed by the crowd. For an Edward Sharpe and the Magnetic Zeros concert, I was expecting bare feet, hoop skirts, and flower children. Although the only bare feet I saw belonged to lead singer Alex Ebert, I saw many pairs of feetless shoes. I was surprised by the demographic of the audience—it was mostly college-age students, being at UC Berkeley, but there was also a healthy sprinkling of real adults, easily identified by their barrel beer bellies and bald spots. Thanks to the massive hill I had to climb to get to the Greek Theatre (I decided to boycott the bus since I couldn’t pay with my SF Clipper Card), I arrived about halfway through the opening set. East Coast veterans Clap Your Hands Say Yeah passed the remaining time quickly, playing fast-paced rock with just the right amount of synth for me. And yes, they did indeed clap their hands during a few songs, with the audience knowingly joining right in. After an anxiously long break, the lights dimmed and the giant paper lantern hanging over the stage bathed the audience in a deep red glow. 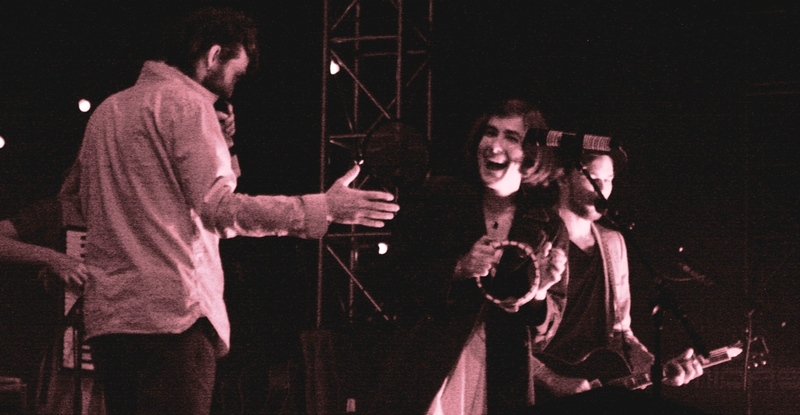 The 10 members of Edward Sharpe and the Magnetic Zeros trickled onstage, with lead singer Ebert grabbing his mic and heading right for the edge of the stage. “I’ve got to say hello,” he said before jumping into the pit and giving out high fives and hugs. He effortlessly hoisted himself over the barrier (throwing his shoes in first) and disappeared for a second before resurfacing on the hands of fans. The band took the cue and launched into “Man on Fire.” Despite the song’s soft sound and mellow tempo, it electrified the crowd instantly. Ebert eventually hopped back onstage, only to jump back into the other side of crowd. Even if I had left after the first song, my mind still would have been blown. The energy and the passion that came along with the song—from both the band and the audience—made it impossible not to dance wildly. The light guitar strums and fun percussion begged you to throw your arms in the air, and Ebert’s dedication to his fans was inspiring. The rest of the two hour set was just as enchanting. They kept it lively at first, following with “40 Day Dream” and “I Don’t Wanna Pray,” but took it down a notch when Jade took the spotlight to lead “Fiya Wata.” In real life, she’s smaller than her voice leads you to believe. She could easily have been mistaken for a fairy with her long white dress and wispy dance moves. Except when she was singing, Jade hung in the background, gliding and twirling across the stage, letting Alex rule the spotlight. If you ever get the opportunity to catch Edward Sharpe and the Magnetic Zeros live, seize it. If you don’t like their music, go just to see Ebert perform. The entire band put on an amazing show, but Ebert was the centerpiece. After he decided (and lamented, many times) that the gap between the stage and the crowd was too far to continually travel, he spent most of the show hugging the edge of the stage, hanging on with his toes as he reached out for human contact. Ebert made sure the audience was comfortable, asked for song suggestions, and even tossed the mic into the crowd after saying, “Who’s got a story? Everyone’s got a story. What’s your story?” (The man who caught the mic took the opportunity to fervently declare his love for his girlfriend amid many cheers.) When he wasn’t stretching to be closer to the audience, Ebert was dancing his signature enthusiastic chicken dance-like jig across the enormous stage, outlandishly tossing his limbs in every direction and even tap dancing at one point. When the stage crew was adjusting a fellow member’s guitar in between songs, Ebert led the audience in a heartfelt “Lean On Me” sing-along to pass the time, before segueing into their megahit (and mega-jammed-out version of) “Home.” As energetic and center stage as Ebert was, he respectfully hung in the background during “Child,” which is sung by guitarist Christian Letts. The band played an even mix of material from both of their albums, throwing in a few unreleased songs and one they had written just the night before (which was much bouncier than most of the songs on Here). The 8,500-capacity theater was stunning and is set up so that every single person, down to the 8,500th, has a great view of the stage. It’s a dream for short people like me. A friend of mine came with me to see the Edward Sharpe and the Magnetic Zeros show. He had never heard of them (although he recognized “Home” when I played it for him, of course), had never been to the Greek Theatre (like myself), and after the show, admitted that their style of music wasn’t something he would normally listen to. It’s been two days since that show and he is still sending me videos and talking about “the best and most inspiring concert” he’s ever seen. Have you heard of Edward Sharpe and the Magnetic Zeros? Either way, turn up your volume, go to their website and have some fun with their home page. It’s a fraction of a glimpse of how compelling their live show is.